Occurrence: Lentils are normally eaten as cooked vegetables or as ingredients in soups. Lentils are called dal or paruppu in Indian cuisine. Lentils are occasionally eaten raw after sprouting but there are concerns regarding the toxic effects of eating uncooked legumes as they contain anti-nutritional factors which are only inactivated by cooking. Allergy Information: Allergy to lentil has been reported from Spain and it is reported that allergy to lentils is more common in Spain than peanut allergy. This may reflect the use of lentil as a weaning food in Spain. The symptoms of allergic individuals after eating lentil range from relatively mild symptoms, such as the oral allergy syndrome, to severe symptoms requiring emergency treatment such as anaphylaxis or asthma. As for most allergenic foods, urticaria (hives) and other reactions of the skin are the most common symptoms. Allergy to lentil is associated with allergy to other legumes with allergy to chickpea and pea reported for over 50% of individuals allergic to lentil. Symptoms:Ibanez Sandin et al (1999)  reported skin reactions in 17/24 patients, respiratory symptoms in 11/24, and gastrointestinal reactions in 5/24. This group of patients had been shown to be allergic to lentil through open oral challenges in a previous study. Pascual et al. 1999  reported urticaria in 10/22 patients, oral allergy syndrome in 7/22, vomiting in 2/22, and wheezing in 3/22 following oral challenge with lentil (2/22 patients did not show symtoms). Kalogeromitros et al. (1996)  reported anaphylaxis in a child with multiple sensitivities to other legumes (chickpea, pea, and white bean) which occurred with both cooked and raw extracts. Kalogeromitros et al. (1996)  used commercial extracts and saline extracts of cooked legumes for skin prick testing. Ibanez Sandin et al (1999)  used commercial extracts of lentil (10 mg/ml w/v, C.B.F. LETI, Spain). Martinez San Ireneo et al. (2001)  extracted ground lentils in 0.85% (w/v) NaCl solution for 16 hours at 4 degrees C in a shaker and compared the extract with extract boiled for 15 minutes. Martinez San Ireneo et al. (2001)  defined a positive SPT as 3 mm above the negative control diameter. Ibanez Sandin et al (1999)  tested 38 patients. Martinez San Ireneo et al. (2001)  tested 36 children with a history of reaction to lentils. Kalogeromitros et al. (1996)  reported prick tests strongly positive to lentil and chickpea and weaker positive reactions to other legumes namely peanut, pea, soybean, and white bean. Ibanez Sandin et al (1999)  reported three groups. Group 1: 24 patients (mean age 7.8 years) with symptomatic type I hypersensitivity to lentils (urticaria, angioedema, vomiting, rhinitis, and/or asthma), confirmed by open oral challenges or a recent, convincing history of anaphylaxis; These patients all had a positive prick test to a commercial lentil extract . Group 2: 9 patients (mean age 9 years) with a history of allergic reactions to lentil in the past, but good tolerance at the time of inclusion in the study, verified by clinical history and/or provocation; in this group, 77% of these children had a positive prick test to the same lentil extract. Group 3: 5 patients (mean age 10 years) allergic to other legumes (two to peanut, two to vetchling, and one to white bean), but always tolerant of lentil; only one of these patients had a positive prick test to a lentil extract. Martinez San Ireneo et al. (2001)  reported that 19/23 of challenge positive patients and 12/13 of challenge negative patients were SPT positive with a crude extract of lentil. However, with boiled extract, SPT was positive in 23/23 of challenge positive and 11/13 of challenge negative patients. Boiled extract at 0.5 mg/ml gave 22/23 and 4/13 positives. SPT gave larger wheals in the 23 challenge positive than the 13 challenge negative patients. They conclude that boiled extracts should be used for SPT. Ibanez Sandin et al (1999)  used extracts prepared by extracting crushed lentils in 20 vols 0.85% (w/v) saline for 16h at 4C and filtered through a 0.22 micron filter. Extracts were heated to 100C for 15min, centrifuged at 10,000rpm 30min and then filtered. Pascual et al. 1999  used extracts prepared from lentils washed, soaked for 1 hour in 500 mL of PBS, and then ground; 10 mmol/L ascorbic acid was added as an antioxidant. The mixture was stirred 18 hours at 4°C and centrifuged at 15000g for 30 minutes at 4°C. The supernatant was dialyzed (molecular weight cut-off, >3500) at 4°C during 24 hours against 100 vol/vol of 10 mmol/L glycine, centrifuged at 30000g for 30 minutes at 4°C, and filtered through a 0.45-µm filter, then lyophilized and stored at 20°C in desecator until needed. This allergen was used at 1 mg/mL final dilution for immunoblotting studies. Pascual et al. 1999  and Sanchez-Monge et al. (2000) used sera from the same 22 pediatric patients with lentil allergy. Ibanez Sandin et al (1999)  reported that the total IgE concentration was 504.4 kU/l (range 25-1878) and 719.4 kU/l (range 123-1346) for patient groups I and II. Significant differences in specific IgE binding levels to lentil allergens were observed between group I (mean OD 2.35), group II (mean OD 0.56), and group III (mean OD 0.13), as well as between groups II and III. Specific IgE binding levels in group I were 2.35 OD to the crude extract vs 1.7 OD to the boiled extract, and in group II, 0.56 OD vs 0.24 OD. ELISA inhibition experiments were also conducted with both extracts. Surprisingly, the boiled lentil extract had a higher specific IgE-inhibition capacity on both solid phases than the crude extract. Sanchez Monge et al. (2000)  report that all individual sera showed specific IgE levels above 5 kU/L, and the serum pool comprising the 22 sera had 155 kU/L. Ibanez Sandin et al (1999)  analysed both crude and boiled lentil extracts by SDS-PAGE under reduced and nonreduced conditions using 14% separating and 4% stacking gels. Pascual et al. 1999 , Sanchez Monge et al. (2000)  and Lopez-Torrejon et al. (2003)  used 1D SDS-PAGE with 15% polyacrylamide separating gels and 4% stacking gels. Ibanez Sandin et al (1999)  transferred proteins to Immobilon membranes (Millipore, Bedford, MA, USA) in a Trans Blot (BioRad) tank in basic media. The membranes were incubated overnight with the serum pool. Afterward, the strips were washed with 0.1% (v/v) phosphate buffered saline/Tween and IgE binding revealed by incubating for 2 h at room temperature with peroxidase labeled monoclonal human anti-IgE (Ingenasa, Madrid, Spain) at a concentration of 2 µg/ml, followed by reaction with 0.1 M citrate buffer (pH 5.0) containing 10 mM EDTA and 1% dextran sulfate (1 ml), 3,3′,5,5′-tetramethylbenzidine in DMSO (20 µl), and 1 M H2O2 (2 µl). Pascual et al. 1999 , Sanchez Monge et al. (2000)  and Lopez-Torrejon et al. (2003)  electrotransferred proteins onto PVDF membranes. After washing and blocking, membranes were incubated with a serum pool or individual sera from patients with lentil allergy or with control sera (1:10 v/v dilutions) and then with alkaline phosphatase–conjugated monoclonal anti-human IgE (clone GE-1, Sigma; 1:500 v/v dilution) and revealed by adding 5-bromo-4-chloro-3-indolyl phosphate/nitro blue tetrazolium solution. Ibanez Sandin et al (1999)  found approximately 30 IgE reactive bands in a crude lentil extract by immunoblotting . The mean number of bands recognized by IgE in sera from patients of group I (from SPT above) was approximately 16 (range 3-30), IgE in sera from patients in group II recognized a mean number of 7 (range 0-15), and IgE in sera from patients in group III, a mean of 2 (range 0-6). A band of approximately 53 kDa was recognized by IgE from 92% of group I patients. Other bands recognized by IgE from more than 50% of sera from patients with clinical sensitivity to lentil ran at 69.8, 51.8, 39.8, 20.7, and 18.4 kDa. Pascual et al. 1999  showed IgE-binding bands at 14, 17, 20, 22, 28, 30, 38, 40, 50, 54, 60, 68, 70, 72, 80, and 84 kDa with the 22 patients’ sera using immunoblotting. 18/22 lentil allergic subjects recognised a 38 kDa protein and 17/22 recognised a 54 kDa protein. This data was used by Sanchez Monge et al. (2000)  to identify Len c 1. Lopez-Torrejon et al. (2003)  showed that the 12-16 kDa allergen and several 15-33 kDa IgE binding bands are fragments of Len c 1. Dehydrated lentils in mashed potato (Pascual et al. 1999 ). Specified only as lentils (Martinez San Ireneo et al. 2001) . The initial dose given was approximately half that reported to have cause symptoms. Symptoms:Pascual et al. 1999  reported that 20/22 studied patients (91%) reacted to lentils while 2 patients reported isolated mild oral pruritus after lentil ingestion but were negative to oral challenge. 8/20 patients (40%) had oropharyngeal symptoms after ingesting lentils, including tingling, pruritus, angioedema of the lips, or throat tightness (compatible with the oral allergy syndrome). 6/20 (30%) patients had only cutaneous reactions, acute generalized urticaria, and/or angioedema. 4/20 (20%) patients had severe acute reactions after ingesting lentils, including laryngeal edema or significant wheezing. One patient had isolated gastrointestinal symptoms (vomiting, abdominal pain, and diarrhea) within minutes after lentils ingestion. Martinez San Ireneo et al. (2001)  reported 23/36 patients reacted on challenge with 16 urticaria, 6 angioedema, 6 oral allergy syndrome, 5 rhinoconjunctivitis, 4 dysphagia and/or edema of uvula, 3 rhinitis, 3 cough, 3 asthma, 2 vomiting and 1 abdominal pain. Pascual et al. 1999  found that 6/22 patients also showed allergic reactions to chick peas, suggesting some degree of either clinical cross-reactivity or polysensitization to legumes. Ibanez Sandin et al (1999)  report that 21 (80%) and 13 (54%) of a group of 24 lentil allergic patients were clinically sensitive to chickpea and pea, respectively. Pascual et al. 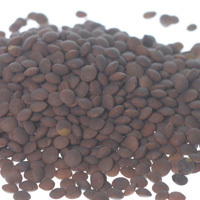 1999  note that 3 patients reported immediate symptoms after exposure to steam from cooked lentils. This was also been reported by Kalogeromitros et al. (1996) . Thus a lentil allergen can be carried in droplets of boiling water. Sanchez-Monge R, Pascual CY, Diaz-Perales A, Fernandez-Crespo J, Martin-Esteban M, Salcedo G.
Isolation and characterisation of relevant allergens from boiled lentils. Martinez San Ireneo M, Ibanez Sandin MD, Fernandez-Caldas E, Maranon F, Munoz Martinez MC, Laso Borrego MT. The diagnostic value of crude or boiled extracts to identify tolerant versus nontolerant lentil-sensitive children. Pascual CY, Fernandez-Crespo J, Sanchez-Pastor S, Padial MA, Diaz-Pena JM, Martin-Munoz F, Martin-Esteban M.
Allergy to lentils in Mediterranean pediatric patients. Lopez-Torrejon G, Salcedo G, Martin-Esteban M, Diaz-Perales A, Pascual CY, Sanchez-Monge R.
Len c 1, a major allergen and vicilin from lentil seeds: Protein isolation and cDNA cloning. Alternatve Allergen Names:Len c 1.0101 and Len c 1.0102; The C-terminal 108 residues was named Len c 1.02. Process, chemical, enzymatic:Sanchez-Monge et al (2000)  have shown that Len c 1 retains its IgE binding in boiled lentils. Nature of main cross-reacting proteins:Sánchez-Monge et al (2004)  reported that Len c 1 strongly inhibited the IgE binding of pea proteins in immunoblotting. Cross-reactivity with pea vicilin is likely because of the high level of sequence identity with Len c 1. Allergen properties & biological function:Len c 1 is a 7S seed storage globulin. Len c 1 is 90% identical with the 47 kDa vicilin from pea, suggesting similar processing and function (Mills et al. 2003 ). Lopez-Torrejon et al. (2003)  made an extract from mature lentil seeds (Lens culinaris cultivar Guareña) which were ground, defatted with cold acetone (2 X 1:10 w/v for 1 hour at 4°C), dried, and extracted with 0.1M sodium phosphate, pH 7.4, and 0.15 M NaCl (1:5 w/v for 1 hour at 4°C). After centrifugation (10,000 rpm for 30 minutes at 4°C), the supernatant was dialyzed (3.5 kDa cut-off) against H2O and freeze-dried. Len c 1.01 was redissolved in 0.5 mol/L NaCl, and salted out with ammonium sulfate at 85% saturation (2 hours at 4°C). After centrifugation, the supernatant was dialyzed against H2O and freeze-dried and then fractionated by means of anion-exchange chromatography on a Mono Q HR 5/5 column (Amersham Biosciences; 1.0-mL total volume) by using a linear gradient to 1M NaCl in 20 mM ethanolamine (pH 9.0; 0%-100% in 120 minutes). The Len c 1.01 enriched fractions were further purified by means of reverse-phase HPLC on a Vydac-C4 column (2.2 × 25 cm; particle size, 10 µm; The Separations Group), eluting with a 2-step linear gradient of acetonitrile in 0.1% trifluoroacetic acid (30%-40% in 30 minutes and 40%-85% in 220 minutes, 1.0 mL/min). Peaks containing Len c 1.01 in each chromatographic profile were identified by means of SDS-PAGE and immunodetection with the pool of sera from patients with lentil allergy. Lopez-Torrejon et al. (2003)  show that this sequence includes the 12-16 kDa allergen and several 15-33 kDa IgE binding bands. Initially the name Len c 1 was given to the C-terminal 108 residue fragment, which was renamed Len c 1.02. Lopez-Torrejon et al. (2003)  report that Len c 1 showed 3 isoforms varying in their degree of N-glycosylation. Sánchez-Monge, R., Lopez-Torrejón, G., Pascual ,CY., Varela, J., Martin-Esteban, M. and Salcedo,G. Vicilin and convicilin are potential major allergens from pea.